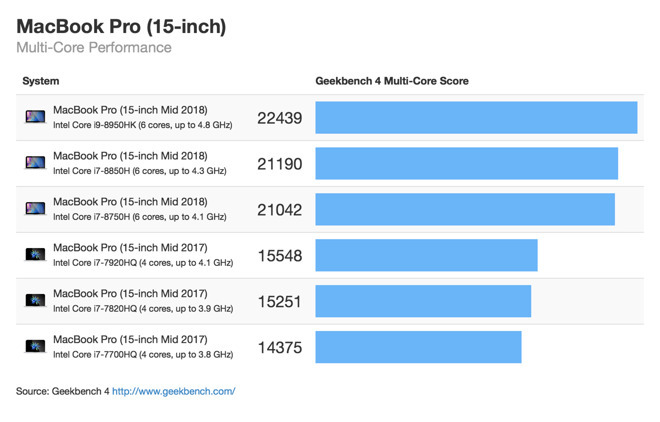 So far, 15-inch MacBook Pros are showing multi-core gains of 39 to 46 percent, while 13-inch systems are up a whopping 81 to 86 percent, according to Primate Labs founder John Poole. The increases mostly due to extra cores —up from two to four on 13-inch Pros, and four to six on 15-inch models — as well as higher Turbo Boost frequencies. The 15-inch laptops have the added benefit of switching to faster DDR4 RAM. 13-inch Pros are still using DDR3, Poole noted. "What's interesting is that the 2018 13-inch models are competitive with the 2017 15-inch models in both single-core and multi-core performance, making the new 2018 13-inch MacBook Pro a smaller and lighter replacement for the 2017 15-inch MacBook Pro," he added. 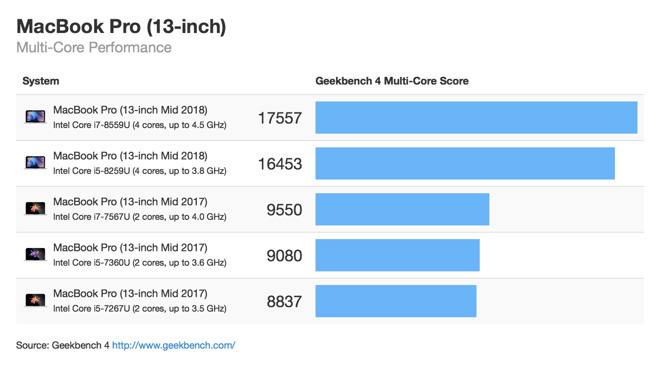 He concluded by claiming that the 2018 MacBook Pro line is "the most substantial upgrade (at least regarding performance) since the introduction of quad-core processors in the 2011 MacBook Pro." Apple released the new Pros just last week. 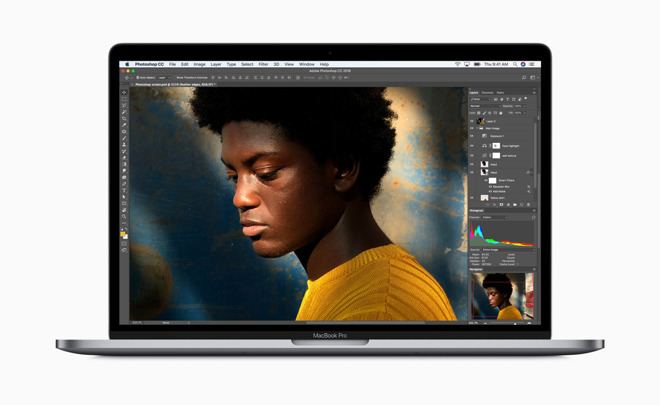 On 15-inch models users can scale up to a 2.9-gigahertz Core i9 processor, 32 gigabytes of RAM, and a 4-terabyte SSD, with a pricetag of $6,699 — more than some iMac Pro configurations. Simply choosing the stock 512-gigabyte SSD, however, knocks an otherwise peak-performance system down to $3,499. YouTube presenter Dave Lee has claimed that the thermal design of the 15-inch Pro doesn't provide enough cooling for Core i9 configurations, limiting top speeds. In a video posted to his YouTube channel on Tuesday, Lee showed one running Adobe Premiere Pro at surprisingly low clock speeds. Tests conducted put the average clock on load at around 2.2 gigahertz, well below the advertised 2.9 gigahertz. Lee's findings are somewhat questionable in that assumptions are being made based on a single machine's performance with an unoptimized app.